We recently completed a modern farmhouse in Oak Forest that may be one of our favorite projects this year! 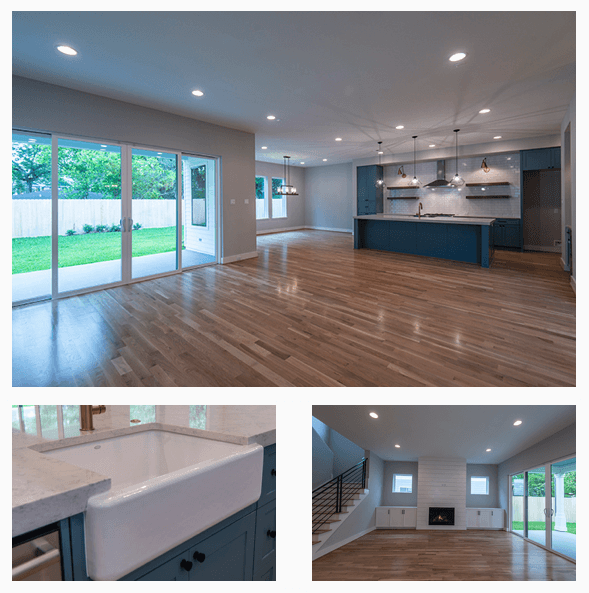 The home started as an inventory home but was purchased mid-construction turning the adorable 4 bedroom, 3.5 bath family home into a semi-custom job. With modern farmhouse style continuing to grow in popularity, take a look below for tips from our team on capturing this style. While incorporating wood is no new trend when it comes to farmhouse design, think beyond wood beams. From barn doors to floating shelves and butcher block counters, wood warms the space and the natural grains will compliment one another making the space more dynamic. We opted for a Weathered Oak and Country White floor stain and clear stained walnut floating shelves. A farmhouse wouldn’t be complete without some shiplap, so we wrapped the fireplace and installed a shiplap accent wall in the study. Additionally, the beadboard on the entry ceiling was a nice compliment to the shiplap and added another layer of texture to the space. Modern farmhouse sets itself apart from the classic farmhouse style by blending various styles, so it shouldn’t come as a surprise that we recommend mixing metals with hardware, lighting and more. Sleek matte black cabinet pulls added some drama to the traditional shaker style cabinetry and complimented the metal light fixtures throughout. Additionally, we added touches of brass and gold with the sink faucet and accent lighting to bring in some Southern flair. Lastly, the black iron stair railing brought a truly modern element to the traditional living room. Light fixtures make a huge impact on the space as they bring so much personality to a room. We brought in light fixtures that had both industrial and antique inspiration, many of which featured exposed bulbs or glass elements. 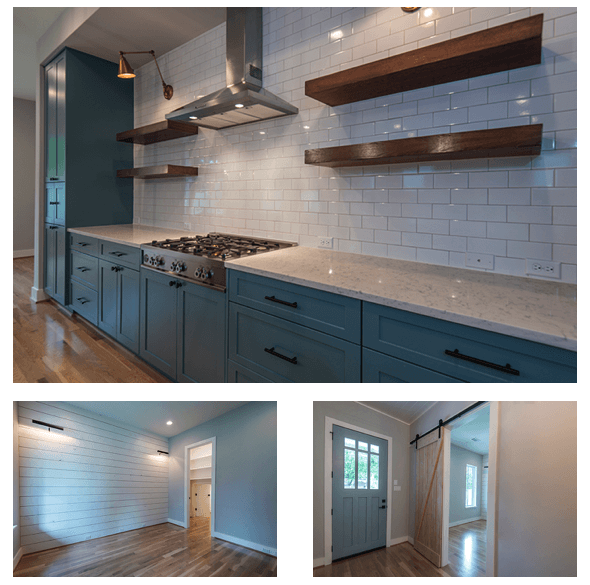 Mounted accent lighting highlighted the floating shelves in the kitchen and bar nook and the black metal art lighting in the study brought even more flair to the shiplap accent wall. Whites and grays are still very much in; however, when designing a modern farmhouse, we suggest opting for more antique colors that bring in warmth and comfort. We choose Sherwin Williams Alabaster for all of the ceilings, doors and trim as it has a warm tone. On The Rocks was used on all the first-floor interior walls, which allowed the Blustery Sky blue kitchen cabinets to shine. In the master bathroom, Classic French Gray cabinets paired with Stardew blue walls. The white and blue paint was consistent on the exterior with Alabaster board and batten and lap siding and a light blue front door and patio ceiling. The key to farmhouse living is function and practicality. Open concept living, kitchen and dining, along with thoughtful cabinetry designs, elevate the usability of a space and provide seamless flow for entertaining and everyday family life. Similarly, a large apron-front farmhouse sink provides beauty and purpose, while built-in storage hides clutter and creates a focal point for the room. In addition to our tips to pulling off modern farmhouse design, there are endless other ways to balancing classic comfort and modern touches to bring your farmhouse vision to life. 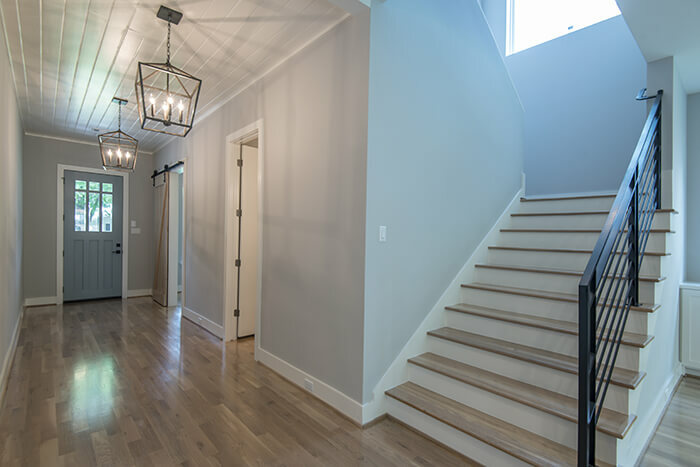 Learn more about On Point Custom Homes Design + Build process and browse our different design styles today!